To know this, it is important to know the benefits of our coating system. Polyaspartic cures rapidly. It soaks into the concrete, filling all the gaps and sealing them tight. The flooring is easy to clean as it repels oils, stains and stands up to high temperatures. A non-porous and seamless surface provides a more hygienic and dust free environment. Polyaspartics are 100X more flexible especially in freezing temperatures, 10X more scratch resistant and will not turn yellow like epoxy. 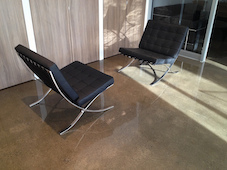 As the polyaspartic cures, it becomes integrated with the floor, making it moisture- and crack-resistant. Being chemical resistant, polyaspartic will protect the concrete surface from erosion, staining and slippery oils. 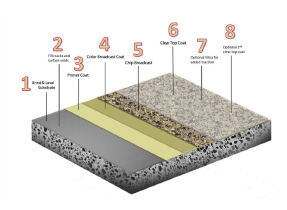 Our coatings can be applied with single or multiple colour designs, or incorporate decorative chips to make it look like granite or terrazzo with added benefit of slip resistance. You can also include artwork stenciling – like a team logo into the floor. Polyaspartic coating is perfect for high traffic areas like garage flooring, automotive garages, commercial kitchens, hospitals, industrial warehouses, retail storefront and public service areas.